The Group 2 SAREX hosted by CAP Squadron 188 at the Oakland Airport this past April was an excellent opportunity for CAP members from around the Bay Area to practice and renew their ratings. Despite adversity and an action packed schedule, 23 sorties were accomplished with every aircrew member getting a shot at the skies. 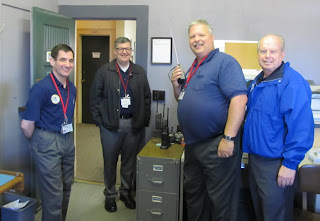 I had an opportunity to fly one day and continue my mission observer training, and working base staff the next. Saturday the 28th started off with some interesting events, the first one centered on a 1980 Cessna U-206G that was scheduled to participate in several sorties. Aircraft older than I am tend to have fussy problems, and the 206 was no exception. It went down for maintenance for a leaky oleo strut before it could even sortie. This struck an aircraft from the fleet early, threatening some aircrew a flight that day. A replacement aircraft from a nearby CAP squadron was flown to the Oakland airport right away. This restored the fleet to three aircraft and the ever efficient base staff was able to have all aircraft airborne and on to their respective grids by 11:00AM. Our aircrew took off and I was flying as a Mission Observer trainee in the right seat. As we left the Oakland airspace and headed towards Livermore, I noticed the snow capped peaks of the Sierras were visible, with brilliant skies and green grass below. Passing over the corner of Lake Del Valle, we proceeded to encircle our targeted quarter grid. Despite some light turbulence, we found several landmarks and Mines Road, a prominent path through the mountains. Whilst planning our mission we were given a training scenario of a missing pilot who was flying home using pilotage. Pilotage is a form of navigation using visual references, maps and the like, no GPS. We deduced probable paths the pilot might take which led us to begin with a route search along Mines Road. We then transitioned to a creeping line search, thereby guaranteeing a greater area of coverage along a probable flight path. This search strategy is useful particularly if a pilot drifted off course or became lost and crashed in the steep and occasionally treacherous valleys. During the search the aircraft was buffeted by some updrafts and downdrafts, and our skillful pilot CAP Lt Col Brett Dolnick made careful use of the technique of searching whilst heading towards descending terrain, and taking the opportunity to disengage and climb when necessary. Completing the creeping line search gave us extensive visibility to the areas beside Mines Road. Satisfied with our search of that portion of our grid, we proceeded to move towards the more mountainous corner of our area that we had not yet covered. The terrain height required a contour search in hills 3800 feet high, the same height as Mt. Diablo. The rough terrain and chaparral below made for a low probability of detection for anything smaller than a twin aircraft. Steep valleys and jumbled contours further hide potential targets, and hazardous terrain and canyons may preclude safe flight closer to anything spotted. During the mountainous portion of our flight practicing the contour search, I learned the value of communicating with your scanner. If the scanner isn't seeing what he needs to or he doesn't know what he is seeing, the mission effectiveness is compromised. I was telling the pilot to make the turns too far apart during the route search, which led our new scanner, CAP 2d Lt Rex Beach, unable to see the route well enough. This was Rex's second flight, and I was a new observer. Figuring out the mechanics of what he was seeing and what he needed to see was new to both of us, and instructing the pilot on where to position the aircraft to ensure effective search coverage was a new challenge for me. This along with my other observer duties took up so much time that for the first time ever in a CAP flight I didn't have the time to take any pictures! I was watching out for air traffic, talking to base over the CAP radio, coordinating with the pilot, and scanner. This coupled with assisting in managing the position of the aircraft quickly becomes some fast paced but fun mental gymnastics. After figuring out what was visible to Rex and me, our pilot positioned the aircraft at the bottom of the grid to the south, where we could fly from high altitude to low altitude, south to north, down the valleys. The mountain ridges were orientated with the poles and we flew through them in a series of parallel tracks. After covering the valleys, we circled the contours of our highest points in the grid, Eagle Mountain and Mount Lewis. At nearly 4,000 feet, this was the highest grid I've been in, and the aircraft performed well. Our grid fully prosecuted, we had an uneventful flight back to base and an easy shot home with the runway aligned straight off the grid and twenty miles out. Following our landing and post mission debrief, some disappointing news emerged. The G1000 aircraft, had a bald spot in its tire upon return. Supposedly the extra weight up front from the glass cockpit tends to add some weight where it's not wanted during landings, and leading to the occasional bald tire spot or flat. With my uncertainty mounting as to whether the rest of the aircrew scheduled to fly during the SAREX could go with just two planes, I spotted the G1000 aircraft being wheeled away by a little pickup truck. Not expecting to see it again I consigned myself to work on my observer skills instead of expecting another flight. Shortly thereafter I was happy to see the G1000 being wheeled right back up to the flight line with a new tire! With the rapid turnaround of our downed bird, all the aircrew that was slated to fly was able to accomplish one flight. The following day CAP 2d Lt Beach, I and CAP 1’st Lt George Gadd manned the communication radios. Working as a team we relayed the orders to the aircraft, and updates to the flight ops. Information such as status and location reports was displayed on a 60” HDTV and the air operations staff could see exactly what was going on the second we got the information. This technique is a sort of digitization of the traditional status board seen at all the other SAREX's I've attended before, including this one. Due to the architecture of our old building, this was very handy, as the rooms are well partitioned. On the second day Air Operations decided to mix things up a bit, by retasking aircrew during their flight. Aircrew were briefed for their standard grid search and then an event would occur during their sortie, requiring them to investigate and photograph a dam, a targeted coordinate, or facility, and return with the results. Air Ops would hand us the task and we would radio the observer and relay the aircrew their new assignment. After all the aircrews concluded their tasks, the planes returned to base for debrief and post-base plane dispersal operations. The Group 2 SAREX proved to be quite successful despite aircraft troubles. The base staff was confronted with two aircraft with mechanical issues which jeopardized some of the sorties. The staff was up to the challenge and successfully resolved both of them. New trainees were able to get the valuable training they needed, and everyone came home safely. Thus continues a proud tradition of CAP preparedness and commitment to Search and Rescue. Capt Lutz Heinrich, Mission Observer enjoyed his participation in exercising a Parallel Search and an Expanding Square search: "The SAREX was a great opportunity to polish up my knowledge and sharpen my skills as Mission Observer. Many thanks to the volunteers who organized the event and brought it to its success."